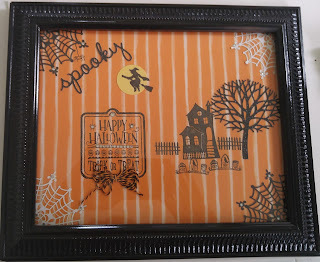 Art Gallery Cards: Halloween Framed Fun, Class Schedules and Product Announcements!! 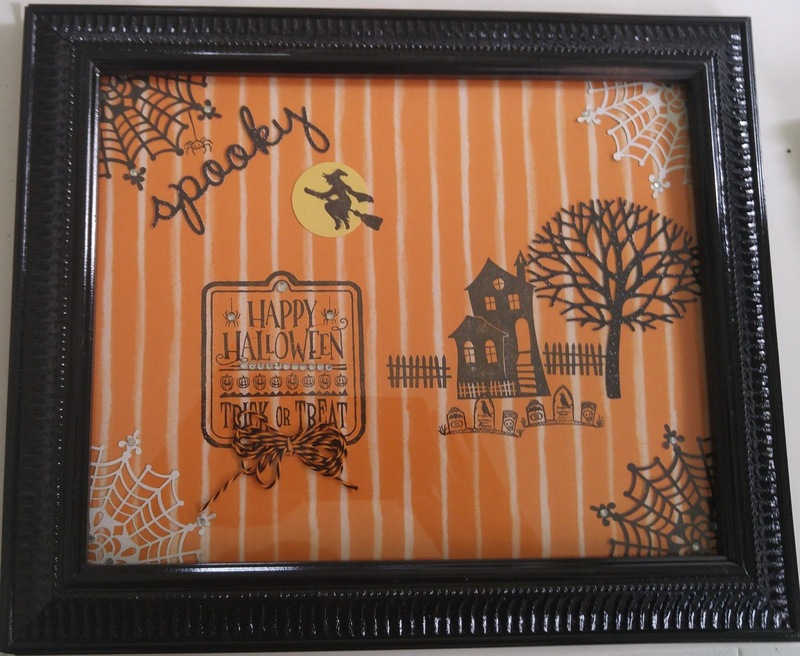 Halloween Framed Fun, Class Schedules and Product Announcements!! I hope you are doing well and ready for a great Labor Day Weekend of fun, barbecues and relaxation!! My Stamp Club met on Tuesday evening and we had a wonderful time--as always! Thank you SOS members for a wonderful evening of fun and pretty cards!!! So.......what does a stamper do when she has 2 extra days??? Well, here is what I've been up to! 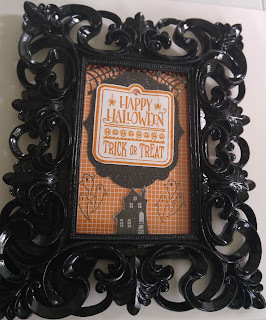 I plan to make 4 more of these! 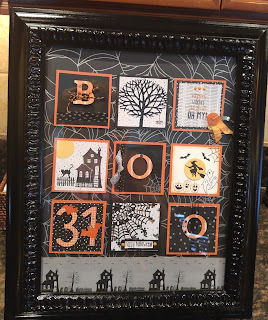 You can easily make these for gifts. I visited my local thrift shops and Ross to find inexpensive frames and painted them with a really good black shiny spray paint. They turned out terrific! Then I gathered papers, ribbon, embellishments--Just the thing we all have plenty of--and went to work (Play!!). I'd love to see your creations if you decide to make these! 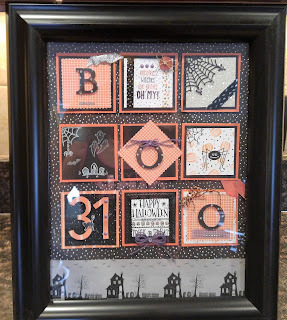 They are so fun to make that I hope to make another round of these for Christmas!! Have Fun!! Here is our schedule for the next 2 weeks!! Please RSVP for your respective classes 3 days prior. We'll also meet again on September 12. 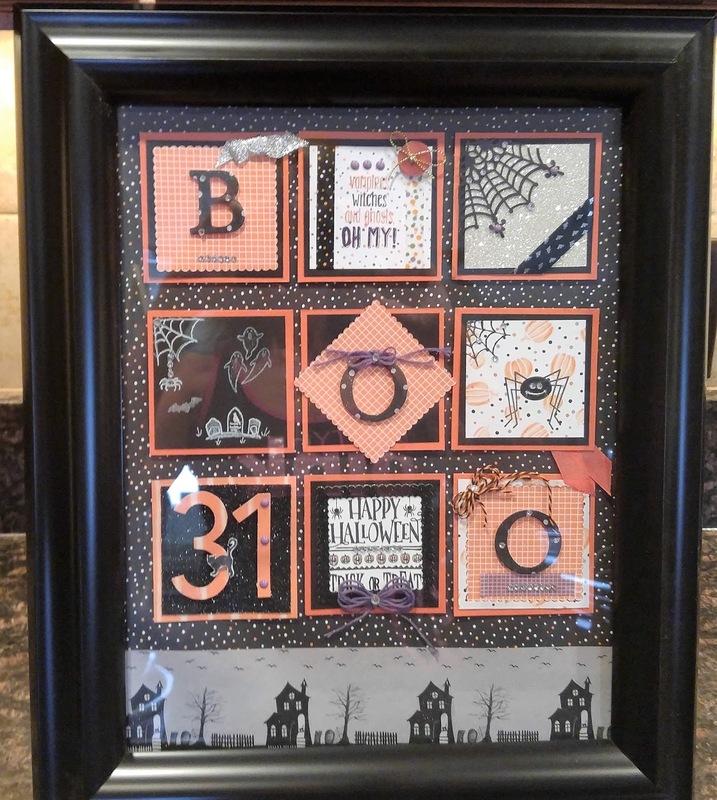 Titusville Public Library: We'll meet on Wednesday, September 7, at 10:30 am to create the cards described above. Cocoa Beach Public Library: We'll meet on September 21 at 9:30 am to create a Christmas, Thanksgiving and Halloween card. SOS Stamp Club: We'll meet on Tuesday, September 27. Michelle is our host. More on the location as we draw closer to the date. I'll send supply lists out for those of you that may wish to bring your stamps, inks etc. Let me know how I can be of service to you!! Thank you for supporting our classes! YOU make it all happen! !